This summer, the Drift Memsaab was touring the lower Himalayas with my 8 year old son, MotorSandal when a coal-black bhes materialized from behind a bush and emitted a foghorn-like bellow. Motorsandal immediately froze and asked "M-m-mom! Is that a dinosaur?" My amusement at hearing this anecdote was tinged with regret. Because by living my life as a city slicker I feel constantly guilty that I'm depriving my kids of the simple life, where kids (like me) lived the clean, nature-bhari, uncomplicated life and played with one toy and wore the same "new" shirt all year before asking for another. This same sense of disenfranchisement draws people like me to uncomplicated singers like Raja Hasan (or Prashant Tamang for that matter). Early on, when Raja Hasan was part of the deliciously tackily named Eklavya gharana (the gharana with no gurus) he was an unknown quantity. But he was called upon to fill a gap and his singing was nothing short of revelatory. Just as he emerged as a strong singer, Kalyanji showed up as a rather stern mahaguru and inexplicably sent him packing. But then... (and at this point in true SRGMP style, this entire blog would go black and white and you would hear a sonic swoosh) the tide turned for Raja Hasan. First, he was called for forgetting lyrics. Once the camera (and Shekhar) caught him reading lyrics off his palm in the middle of a performance, reminding me of my friend in school - lovingly called Piston for reasons I'd much rather not go into here - in the middle of an exam. Then the whole nek insaan bit got a little old. As in all weekly reality contests, your popularity ebbs and flow. Its no fault of the contestants, just the natural momentum of audience fickleness. Add to this that straight face he made whenever something positive was said, as if to say "I'm so seedha I can't comprehend praise", which got to some people. Finally, Himesh, sensing that his chela Aneek needed some path clearing promptly got to work on Raja. First, castigating him publicly for messing up a song and then in a confounding turn of events virtually blaming him for the eviction of Mussarat Abbas. All this reduced Raja to a vocal hobble when we saw him last week. 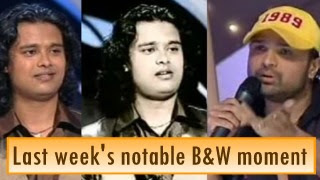 Even Vishal and Shekhar felt obligated to fake-praise his ordinary singing in an effort to boost their last chela in the competition. There are rumors that he finished top of the class in this week's upcoming episode. But regardless of the outcome, with Aneek delivering tremendous singing on demand, Poonam winning audiences over with her range and Amanat barely making mistakes, Raja has now become the one to watch. Will the train blow past the station or will it end up in a wreck? Visions of Mauli Dave, although this one sings a lot better! A good indicator of Raja's performances for me have been his youtube views and the number of hits my his blog gets immediately after every performance. Hits-wise, things were best when he sang Maahiya, Vande Mataram and Teri Deewani, though he was criticised in the last instance. And strangely, after Pardesi Pardesi and the HR mauling, sites visits jumped up by almost three times! Hope Besharmiya goes at him yet again this week. It helps Raja. And of course, helps my blog. The Piston nick sounds interesting Aspi. I would love to know more about that. @ Manish "A good indicator of Raja's performances for me have been his youtube views"
The first Indian video to have made it to the top 100 most watched videos on youtube is that of a clip with Rajini and a midget breakdancer. It currently ranks at 91 with close to 6.9 million hits. A surrogate for quality I presume! His rendition of 'Maa Tujhe Salaam' bought tears to my eyes. Yes, he my not be as versatile as Aneek, but at the same time he is absolutely excellent in his 'jonar'. Also Aneek's voice even if more versatile has relatively less to distinguish it from the current playback singers. Unrelated comment...Aspi would you be doing a music review of Saawariya? Would like to read your opinion. Hey Ritha, I tend to not do too many music reviews because I'm not good at it. I usually will pick out a song and do a "Best new bollymusic" type of post (I have an oldish one I should publish one of these days). But let me see if I can get my hands on the music and see what transpires. The fate of Raja is all about Him-mess Besharmiya pulling rank and wallowing in own power trip. His real message to the singers and janta is: "I am the king maker and thou shalt not (him)mess with me!" If we go by talent..it indeed is raja's turn to leave the show after sumedha..
Apart fm the natural ebb and flow of performances, I'm beginning to think a few of things have gone against Raja (apart fm the sabotage by HR! ): 1) I tend to judge Raja (and perhaps others do too) by the quality of his own performances rather than against other competitors. I expect to be moved by each performance as I was moved by the piya haji ali one (my fave so far). 2)The diversity /versatality principle of Vish-Shek may have moved the needle too far fm Raja's jonar. Put the 2 together and maybe Raja peaked too soon. HR's sneak attack brought a crisis of confidence which made things worse. I'm torn between reluctant admiration for HR's sheer cunning and distaste at his viciousness. Perhaps Vish-Shek have the best strategy - Sit back and let HR cross the line in terms of blatant manipulation and have that backfire on him. I personally love both his voice and his jerry curls. As for Aneek v/s Raja, while I always enjoy Aneek's near flawless performances, its Raja that I re-listen to full volume after a couple of tokes. HR falls in the "Have-nots" category. Himesh is irritating to the core.As I am watching the 092207 show I must say that he needs a lesson on how to talk sensibly, how to respect others opinions and allow others to talk. At this moment I feel like screaming SHUT-UP HIMESH. exactly! !himesh is just sooo IRRITATING!! .... i am reminded of a friends episode.. where chandler asks joey if he realy hates janice that much ..and joey says..' i feel like ripping my arm off .. just soo i would have sumthin to throw at her '.. if i had been on the sets.. i would have just ripped off his own arm .. and hit him on his big fat head with it!! have little say as we continue being subjected to Himesh and in his antics in the name of 'Saraswathi Ma'. Also, it was sad to see directors like Ismail Darbar and Bappi Lahiri agreeing and nodding their heads each time Himesh made outrageous statements. Kudos to Vishal-Shekar and the contestants for making the show palatable. The Crux of the matter as realized by Manish the founder of "rajahasan.com"
"HR to kabhi show se baahar jaane waala nahin hai, woh to hum dono ko maloom hi tha. HR to wohi kar rahaa hai jo producer us se karvaate hai. Raja ke fans zaraa bhadak jaaye, aur khoob vote karein! Raja final mein hai, to apnaa kam almost ho gaya hai. Jitna exposure milna chahiye, usey mil jayega. Mujhe to aisa lagta hai ki Raja title naa jeete to accha hai - woh 50 lakh ka contract koi kaam ka nahin hai. 50 lakh do saal tak kheechenge Zee waale, aur tab tak sab thanda ho jayega. Us se accha hai, ab waapas VS, SEL, Salim-Sulaiman ke chakkar kato aur jo bhi kaam mile - ad jingles ho ya chotey motey playback singing, shuru karo. I was quite amused to find the conversation thread from Orkut that I couldn't resist quoting ( refer the post above) has been deleted minutes after my mention of it here. Manish I understand owning a popular fan site and not to mention some ridicule sites can be a pain. You can not even think aloud, lest the fanatics misunderstand and take the winds off the drummed up support. You can not even dare to whisper the truth that you believe in. It must be very painful to lead a double life. I understand your pain partner, All my sympathies are there for you. Wish someday, and some years and some more saregamapa sessions down the line you would realize oozing undiluted hatred for a person makes you more like the person you hate. And too much hate is bad for creativity. Yaar, Picked up from Orkut, post some a link next time. I can't find anything in there and I don't go there often either. posting a link would not have helped as the thread was deleted soon after I copied and pasted it here. If you are interested in knowing what the content was then you may refer my first post(that would be just one comment above yours).The relevant portion is in hindi written in english script and is between inverted commas.